I've turned up the color quotient even more from Spring, and it's here to stay! New green and white floral "Rosalie Chair" from Pier 1 and also a new "Redmond Stripe" rug from Pottery Barn. The rug that was in here before has moved on up (like The Jeffersons) to the Master Bedroom. 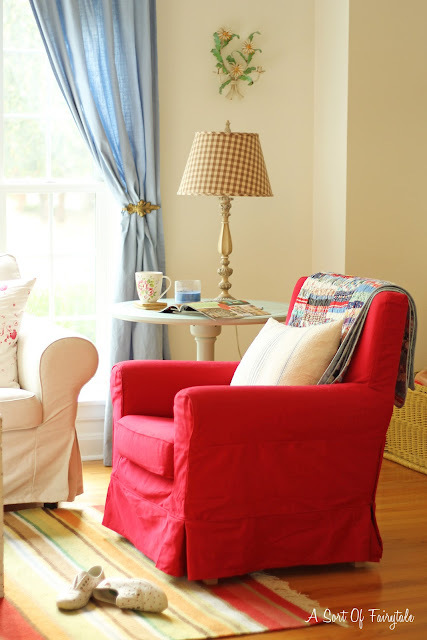 The red chair had a white slipcover on it and used to be in my daughter's room. I bought the new red cover at IKEA (the chair is from there). The rocking chair that was in it's place is in her room now. This is my most favorite "look" I have done in the house so far, I feel it is truly "me"! Hope to share some pictures of the dining room, attached to this room, soon...it has undergone some changes from spring too! Beautiful! I adore your new green chair. I'm totally into spring green right now and that really hits the spot. Your living room looks fantastic. 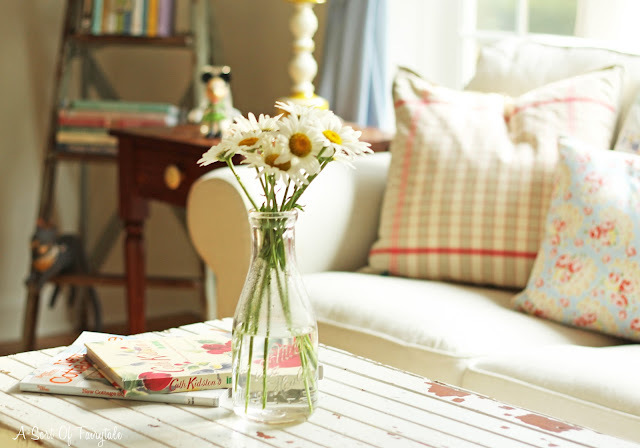 I am Eva from the Fancy Windows blog and i am your neighbor at Hellocotton Desing page. I want to tell you that you have a very pretty home!! Really lovely!. So happy to have you as a neighbor!! Great blog! Love all the additional pops of color, Stacey! Your new chair is just perfect for the room. Love the sweet cottage feel of this room! 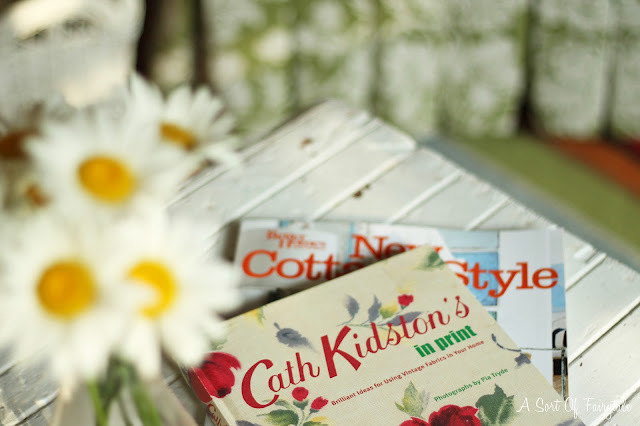 It has that kick off your shoes and curl up with a good book feel! And I just might have to get that chair for my bedroom - super cute! Oh Stacey! These jolts of colour shout "summer!" The red is the best. I love how it adds zing yet compliments all of the other things in the room. Great mixing of patterns, too. i love, love, love all the color!!! i would keep it around too. you have a wonderful eye. The red really makes the whole room come together. You style is fabulous. Such a beautiful room. Stacey, your living room looks so cozy and inviting. I love color too, so it's nice to see how much warmth and comfort it brings to a room. Your ladder is perfect to bring height in the corner. Great idea to use it for books. it looks so happy and colorful! i love it! Oh yes! Bring on the color! I love the soothing feeling of a quieter color scheme but color just makes me feel happy. Soothing can happen while we sleep- right? Love the addition of Minnie. :) A future sylist in the making. Stacey your pictures are beautiful!! I have been in this beautiful home of yours and it is stunning and so beautiful how you put the textures, prints and colors all together. Stunning is an understatement. Thanks for taking all the pictures of my home I can't wait for the reveal!!!!! 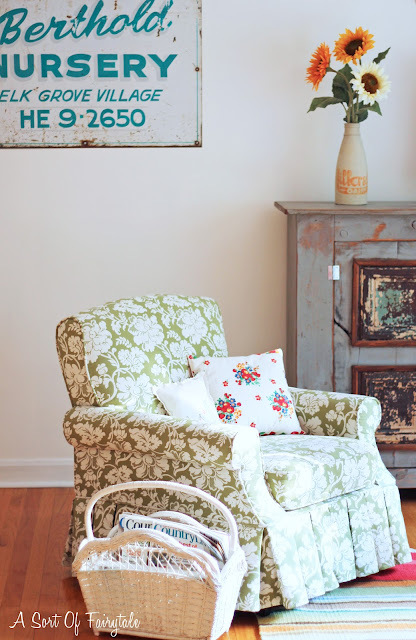 I love love love that chair from Pier One!!! It is all beautiful. I LOVE IT ALL! I need this look in my home! 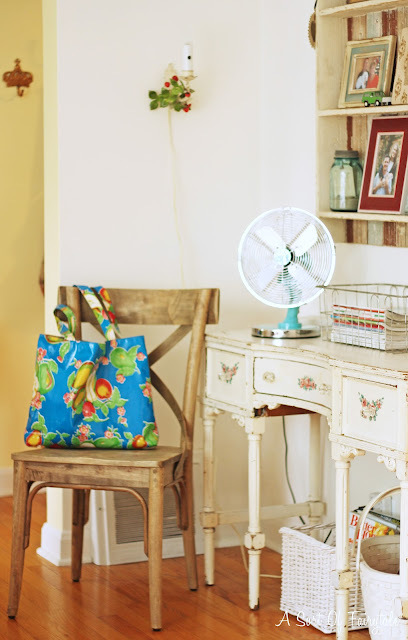 I bet you could come and arrange/move things in my home to add some extra cuteness... email me your pricing, I'd love to save and have you come in the fall for a fun weekend. Let me know if you're game! I love the chair, too! 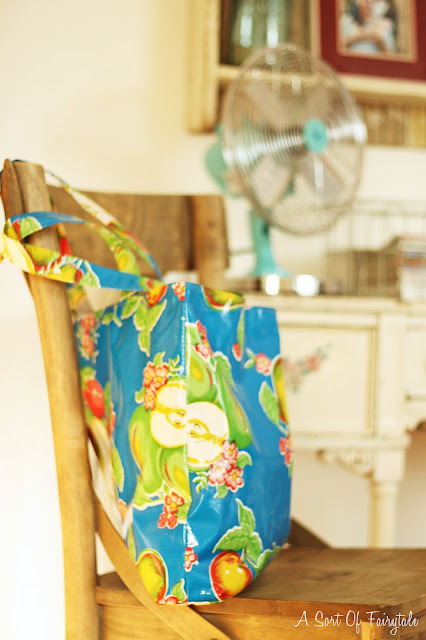 I've got a chair that I would love to reupholster in that same fabric! 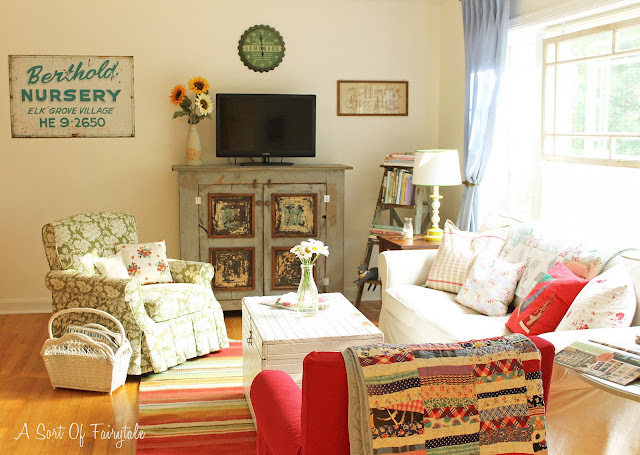 I am a color girl so I love your living room changes. I had to laugh because we obviously have similar tastes. I have the Cath Kidston book on a little table next to me right now and the Cottage Style book is across the room in a basket. I am busy hunting down fabric to make new sofa slipcovers. I might just go with white and spice it up with colorful pillows. 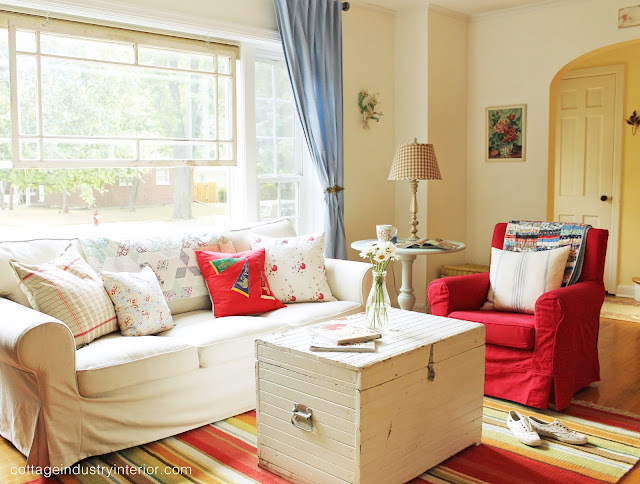 I love how you decorated your living room...it's so pretty! Love the new chair from Pier 1. Thinking I need to make a trip there. So beautiful and cozy. I saw this on FB....Home talk, maybe....just today. Love your space! The colors work so well together. So Kath Kitson of you! Your home is lovely! Great colors and I love your old sign and the ladder in the corner. Great little touches that add so much character! I think this is perfectly you, Stacey! I'm in love with the green chair and that gorgeous trunk for starters. I love color. And you have definitely given this room some cozy charm! that chair totally makes the room...and I am so sad I didn't get to see you Sat!! please let me know when you are back to visit DeKalb! everything is looking fabulous! now you have me rushing over to pier 1!!!! Stacey ~ I love, love, love your new chair! 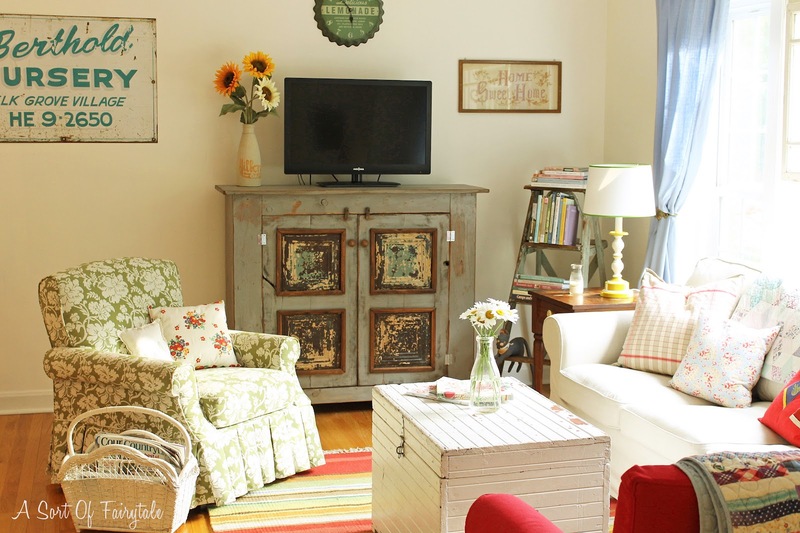 Your living room is totally adorable, it just keeps getting better and better!! Love it Stacey!! I love it both ways!! You have a win,,win!! The pennant pillow is great! Where did you come across the pennants?? Stacey, your room just gets better and better! Fabulous new floral chair in one of my favorite colors. I love all your hand made and vintage touches throughout, but I truly covet your old nursery sign. This room is just waiting for a magazine feature!! you had me at "jeffersons"! smitten from top to bottom. fabuloso!!! Oh how I've missed reading your beautiful blog, my friend!!! LOVED what you've done to this room!!! It is SO you!!! :) Hope you've been well. It's perfect! I love how your home is such an expression of YOU! I love how you effortlessly mix cottage, farmhouse, and vintage elements and create these utterly breath-taking spaces. You are so talented! So glad you're enjoying the summer. I've been scrambling to find time to blog and leave comments too, but that's how it goes this time of year. Gotta enjoy summer while it's here! That chair just look lovely. I love that its red. You have a great taste. I just love your home!! All the gorgeous colors make me so happy to look at.It's beautiful. Just wanted to stop back and tell you that I loved that chair so much that I went to Pier 1 and ordered it for my bedroom. And it was even on sale - yay! Can't wait for it to arrive. Just another example of the power of the blog world to share and inspire! Every home needs at least one Minnie. Love the new pops of color. The chair is fab. Looking for something similar for my bedroom. I love the nursery sign. Always love to visit! My chair has arrived and I totally love it! It's just the perfect touch in the corner of my bedroom! Thanks for the inspiration!